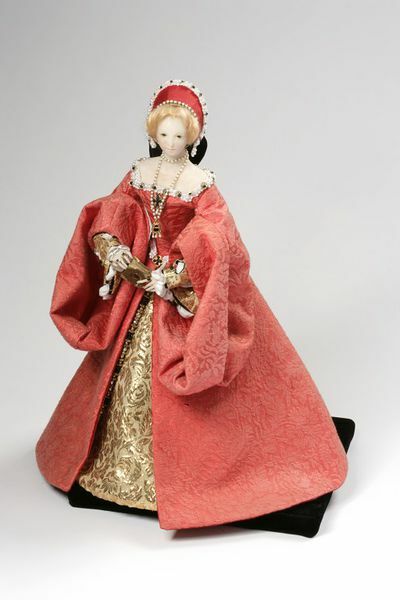 The doll depicts Elizabeth I of England (1533-1603) as a princess, based on an anonymous portrait of her in the Royal Collections. As daughter of King Henry VIII and his second wife, Anne Boleyn, Elizabeth was born in 1533 to a life of great splendour. But she lost her royal status with the end of her parents’ marriage and her mother’s execution in 1536. Poverty and suspicion overshadowed her childhood and adolescence, but she eventually became Queen of England in 1558. Sheila Wallace, the doll maker, felt that in some ways Elizabeth symbolised the doubts and problems faced by the young of any century, and wished to show her as a girl with a turbulent and unknown future. Wax portrait doll depicting Elizabeth I of England as princess, based on the anonymous portrait of her in the Royal Collections. The doll has a poured wax shoulder head and limbs on a muslin body with a wire framework and polyester fibre stuffing, black glass eyes and human hair of a tawny colour. The gown is of coral-coloured damask, the bodice with a wide square neck and hanging sleeves over paned undersleeves, and the skirt open to show the contrasting kirtle beneath; the under kirtle is of saffron yellow, over a grey hooped petticoat, white lawn chemise and (anachronistic) drawers, cherry red stockings with decorated clocks, garters and black shoes. She also wears a matching coral-coloured French hood with a black snood at the back, a pearl necklace, two pendants, and rings, and holds a book. Designed and made for presentation to the Museum of Childhood, Bethnal Green. 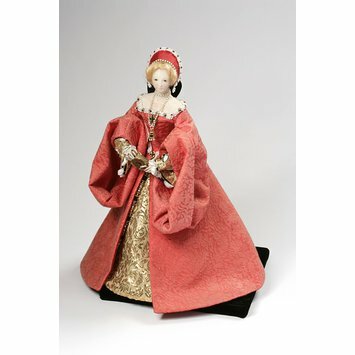 The doll is based upon the anonymous portrait of Elizabeth I as princess in about 1546, which is in the Royal Collections, and which has been ascribed to various artists including William Stretes.